First off, I just want to thank you all for the love and support on my post Monday. I honestly can’t even begin to tell you all how much it means to me to have you here and following along on my journey. To have such kind, caring, and loving people reading my blog is something I’ll never take for granted and I appreciate it more than I can express. You all are truly the reason I work so hard on this blog every day and I definitely wouldn’t be doing this with you, so thank you!! 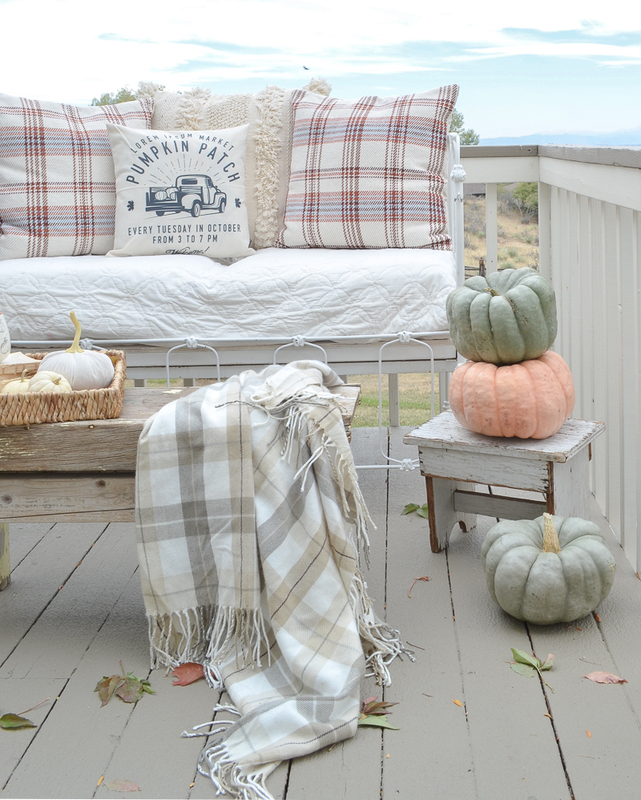 Now, let’s chat about some cozy fall decor on the patio, ok? I’ve been excited to share this cozy little space with you guys because I’ve actually been using it a ton lately. We’ve had some pretty warm days around here over the past few weeks, so this has become my favorite place to hang out and watch the kids play. If you’ve been following along for a while, you’ve probably seen this vintage crib I converted into a little love seat a few years ago. 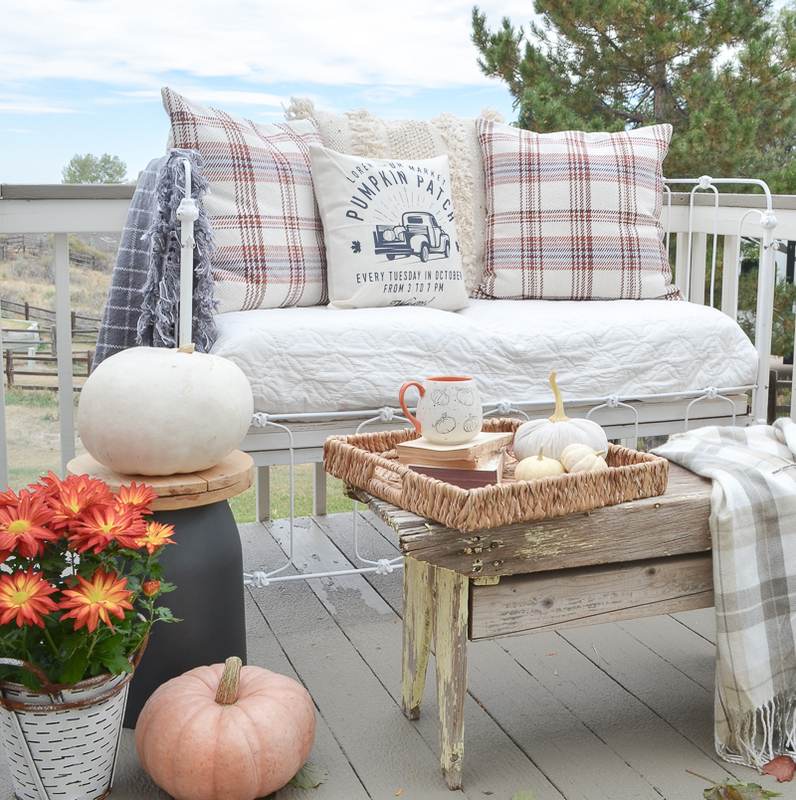 We’ve moved it all around the house and now it’s worked its way onto the deck. It’s actually super comfortable and always everyone’s favorite place to sit. The kids especially LOVE it. And it just makes the coziest spot to curl up and watch the sun go down on a cool fall night. 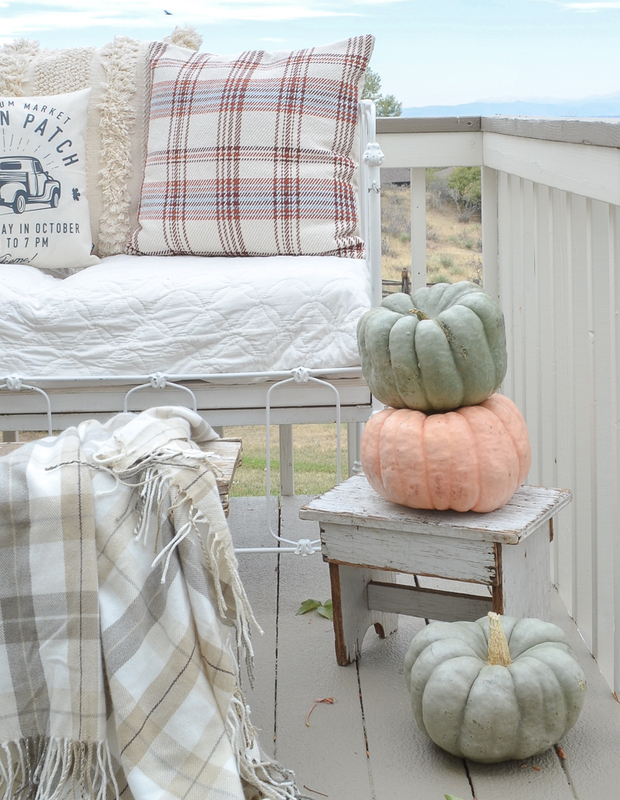 I’ve become obsessed with these funky little heirloom pumpkins. Aren’t they so cute? I just love the muted colors–the green ones are my favorite. 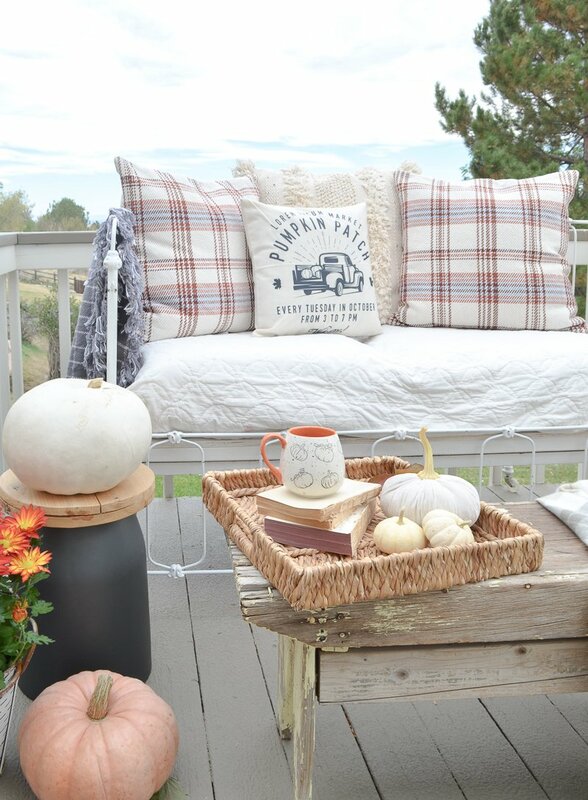 Remember that pumpkin patch pillow cover I mentioned last week? Where there it is! I still can’t believe it was under $10. BEST. AMAZON. FIND. EVER. This cozy little spot has been one of my favorite places to hang out lately. And I just love how cute it looks all spiffied up for fall. I’m trying to enjoy this space as much as I possibly can right now because I know winter is on the way. In fact, it could start snowing any day now that we’re officially into October. But let’s just pretend that isn’t going to happen any time soon and this beautiful fall weather will stay forever, ok?! That is just so beautiful! 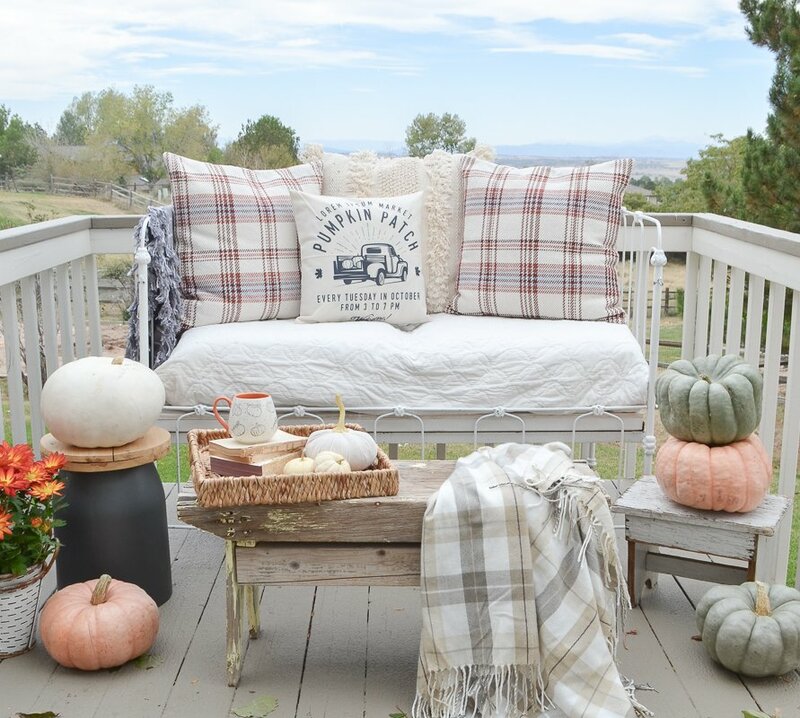 I love how you turned the crib into a loveseat! 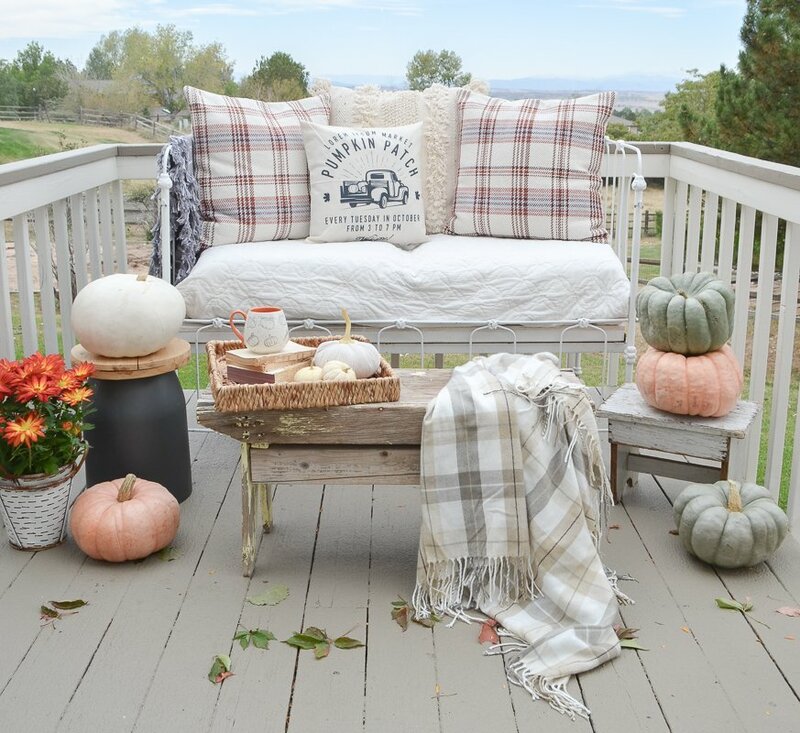 I can just imagine sitting there having a cup of morning tea in the lovely fall weather! Oh it’s the best spot for that Lisa! I LOVE it so much. I’m just sad that I won’t be able to enjoy it much longer. Winter is quickly approaching here in Colorado. I just want to let you know that I look so forward to the days that I know I’ll see your post! I am so glad that I stumbled across your blog one day when I was searching for ideas for my home! You are truly an inspiration and I love everything you have done with your home! Oh, and your patio looks super cute and comfy!! Thanks for being a bright spot in my day! Love how you styled it! Looks fabulous! Thanks Dawn! And I will usually bring everything inside if a storm is rolling in. Sometimes I forget, but usually everything is fine! take in at night that is!!~! Beautiful! 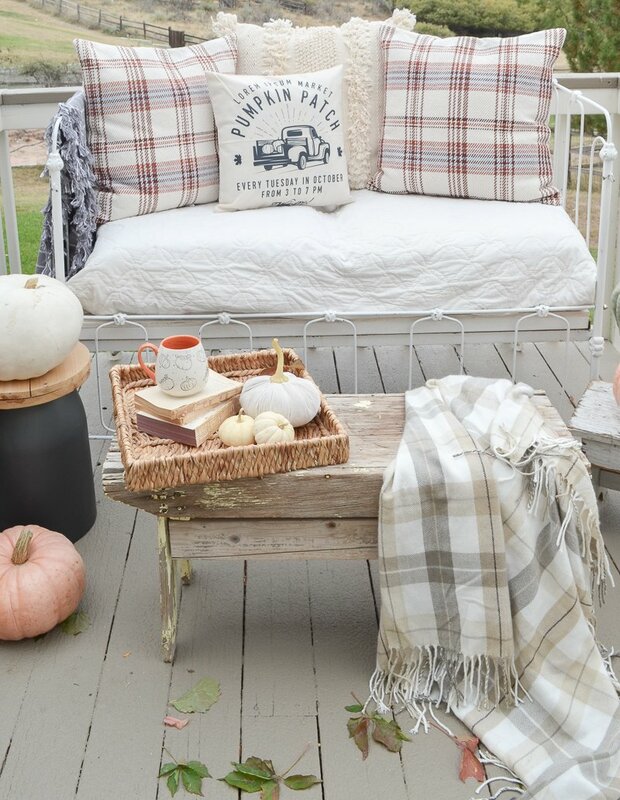 Question- When do you start putting Halloween decor out? Hi Cindy! I don’t really do any Halloween decor anymore actually. But you never know, I might pop in with a Halloween post! Hat a beautiful day to be setting outside. Just beautiful! Yes indeed! I wish I could hang onto these beautiful days forever. Winter is quickly approaching here in Colorado! Ah thanks Angela, we are definitely blessed with a nice view. That’s part of what sold me on the house 3 years ago! I’m fairly new to your blog but look forward every day to see if you have posted anything new. You have created a very cozy, warm home. I think it is great you have been invited to participate in Silobration – Magnolia Market. My daughters took me to the Silos last April. Best trip. Didn’t see Joanna or Chip but got a really nice picture of her mother. Oh Carol, you have no idea how happy that makes me. SO glad to hear you enjoy checking in every day. That makes it all worth it for me!! And thank you for the kind words about the Magnolia trip, I can’t wait. And I’ll be sure to share about it all once I am back! It’s actually paint. My husband just re-did it a few weeks ago. The color is called Warm Stone by Sherwin Williams. And I only spent about $70 on pumpkins this year. All of the faux ones are from last year! 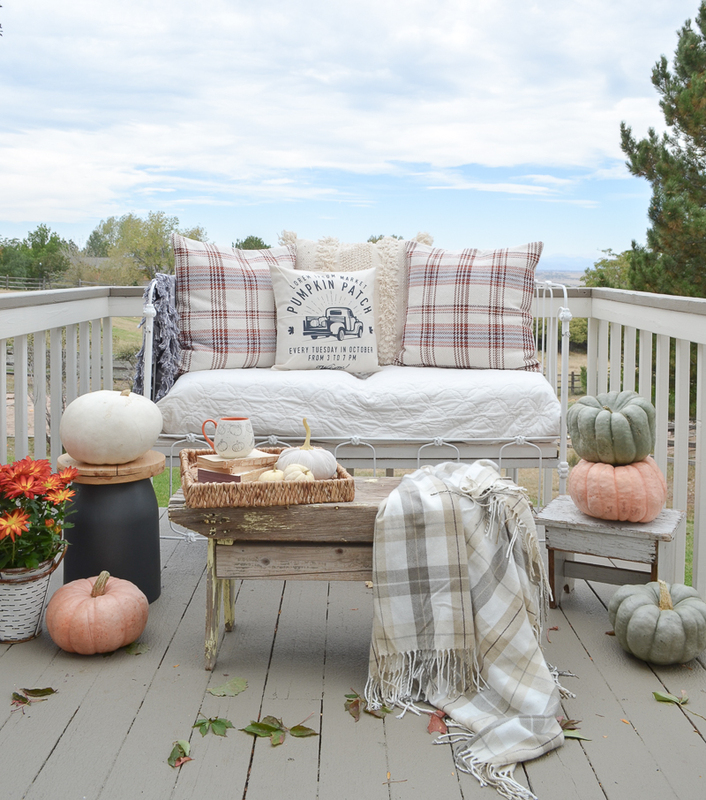 Oh, this is soooo cozy and perfect for fall!!!! I’ll be right over with a thermos of coffee and fresh doughnuts….hey a girl can dream right! Lol!!! !